For maximum fuel pump, injector, and engine life, install a coarse-element filter before the fuel pump and a fine-element filter between the pump and the engine (see our Fuel Filter Selection page for more details).Marren Fuel Injection offers rebuildable 150 micron coarse-element and 10 micron fine-element filters. 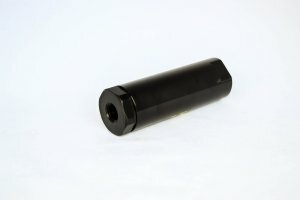 Our filters feature billet aluminum housings with threaded 3/8 inch NPT inlets and outlets.Dimensions are 5 inches long by 1.5 inches in diameter. The 150 micron filter uses a washable stainless steel filtering element, while the 10 micron filter uses a replaceable cellulose element. We also offer stainless steel mounting brackets with fuel-resistant elastomer insulators. Price is $95 per filter, $15 per bracket. Marren Fuel Injection offers rebuildable 150 micron coarse-element and 10 micron fine-element filters. These filters feature billet aluminum housings with threaded 3/8 inch NPT inlets and outlets. Dimensions are 5 inches long by 1.5 inches in diameter. The 150 micron filter uses a washable stainless steel filtering element, while the 10 micron filter uses a replaceable cellulose element. 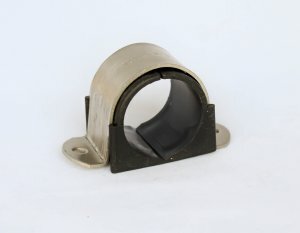 We also offer stainless steel mounting brackets with fuel-resistant elastomer insulators. Price is $95 per filter, $15 per bracket.